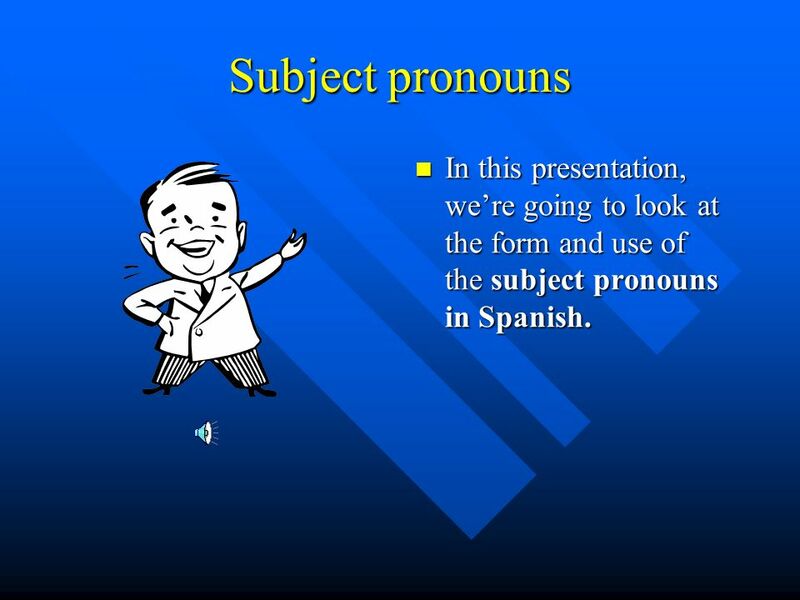 Subject pronouns In this presentation, we’re going to look at the form and use of the subject pronouns in Spanish. 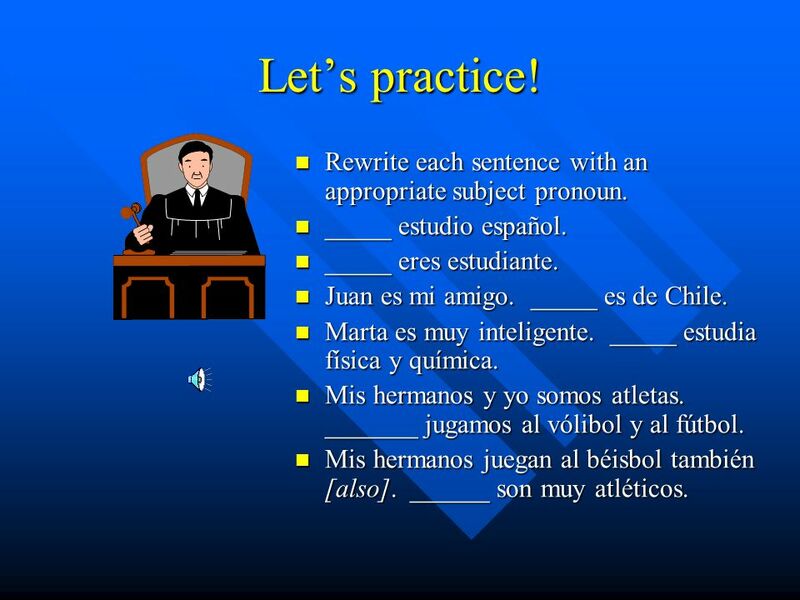 1 Subject pronouns In this presentation, we’re going to look at the form and use of the subject pronouns in Spanish. 2 Let’s get started! Compare these two sentences: Jorge es mexicano. Él es mexicano. In the first sentence, we name the person who is Mexican. In the second sentence, we replace the person’s name with the word él. 3 And your point is…? 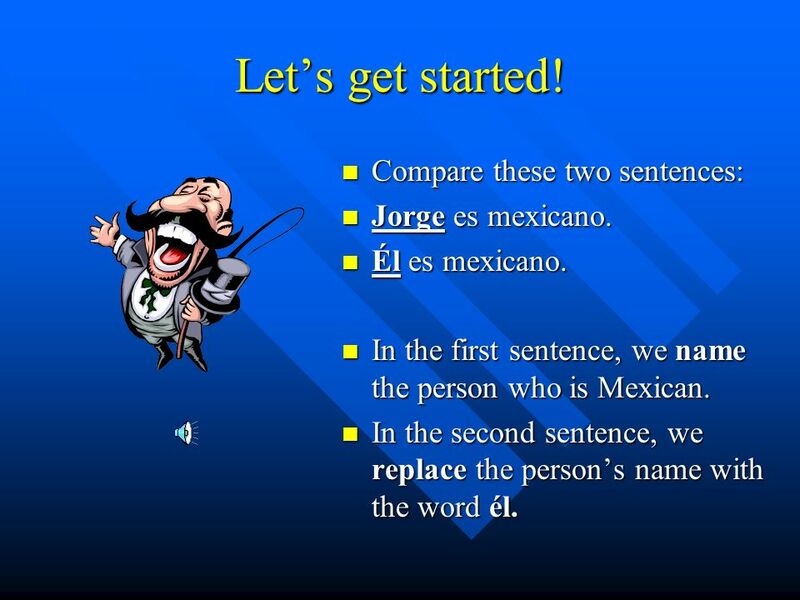 A pronoun is a word that replaces a noun: Jorge = él. 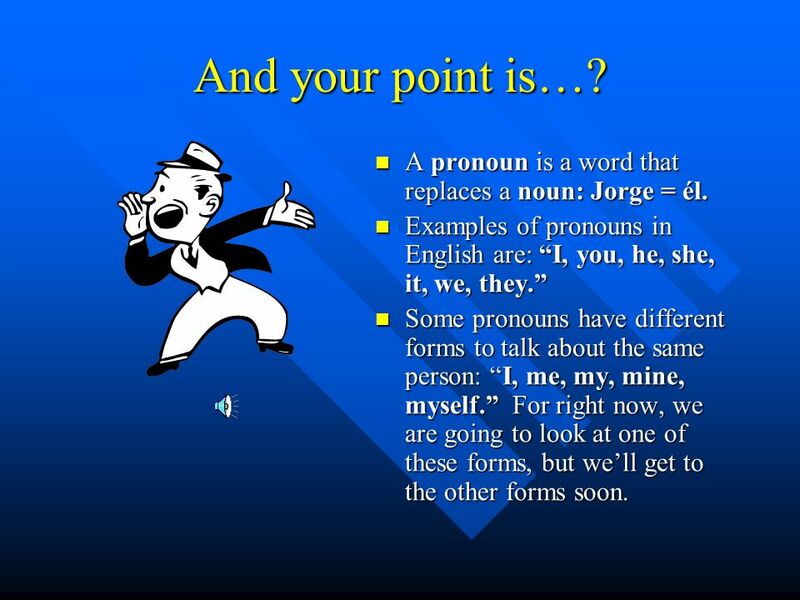 Examples of pronouns in English are: “I, you, he, she, it, we, they.” Some pronouns have different forms to talk about the same person: “I, me, my, mine, myself.” For right now, we are going to look at one of these forms, but we’ll get to the other forms soon. 5 Yo This means “I” and is used in the same way as in English. 6 Él y ella These pronouns are used in the same way as their English counterparts: Jorge y Ana son mexicanos. Él es de Guadalajara y ella es de Acapulco. 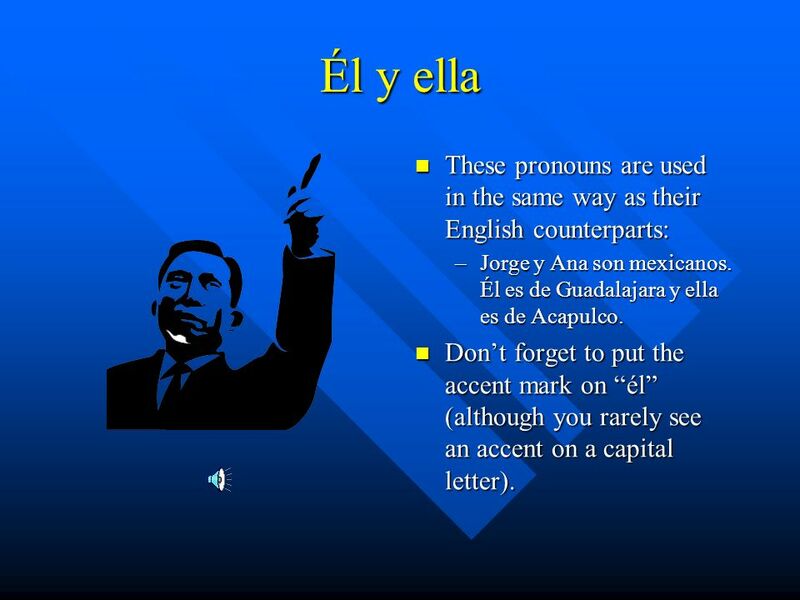 Don’t forget to put the accent mark on “él” (although you rarely see an accent on a capital letter). 7 Ellos y ellas In English, we have one word to express the idea of “they,” but in Spanish, we distinguish between “they” for masculine and feminine: Jorge y Juan son mexicanos. Ellos son de Guadalajara. Ana y Gloria son mexicanas. Ellas son de Acapulco. 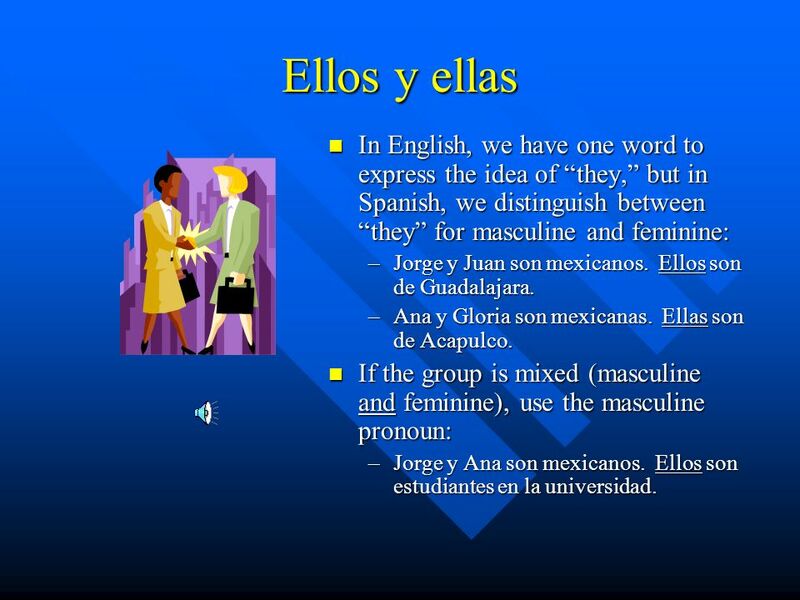 If the group is mixed (masculine and feminine), use the masculine pronoun: Jorge y Ana son mexicanos. Ellos son estudiantes en la universidad. 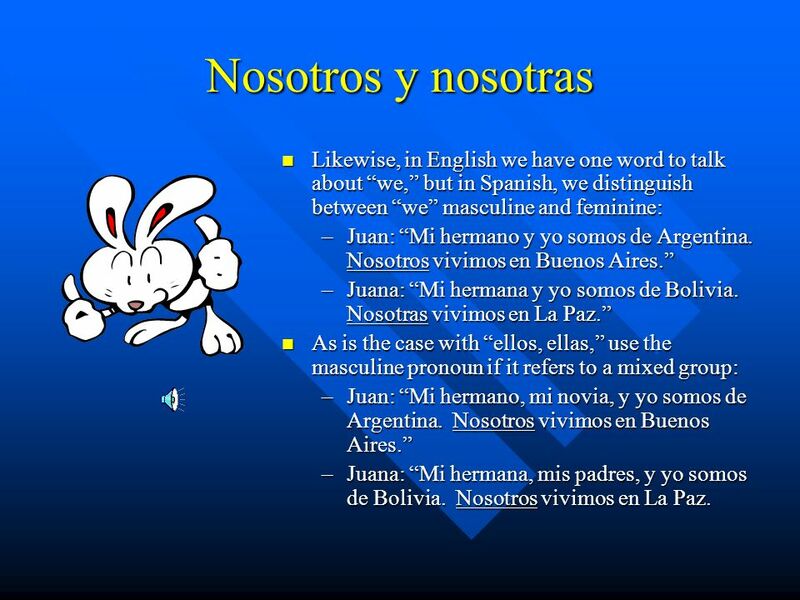 8 Nosotros y nosotras Likewise, in English we have one word to talk about “we,” but in Spanish, we distinguish between “we” masculine and feminine: Juan: “Mi hermano y yo somos de Argentina. Nosotros vivimos en Buenos Aires.” Juana: “Mi hermana y yo somos de Bolivia. Nosotras vivimos en La Paz.” As is the case with “ellos, ellas,” use the masculine pronoun if it refers to a mixed group: Juan: “Mi hermano, mi novia, y yo somos de Argentina. Nosotros vivimos en Buenos Aires.” Juana: “Mi hermana, mis padres, y yo somos de Bolivia. Nosotros vivimos en La Paz. 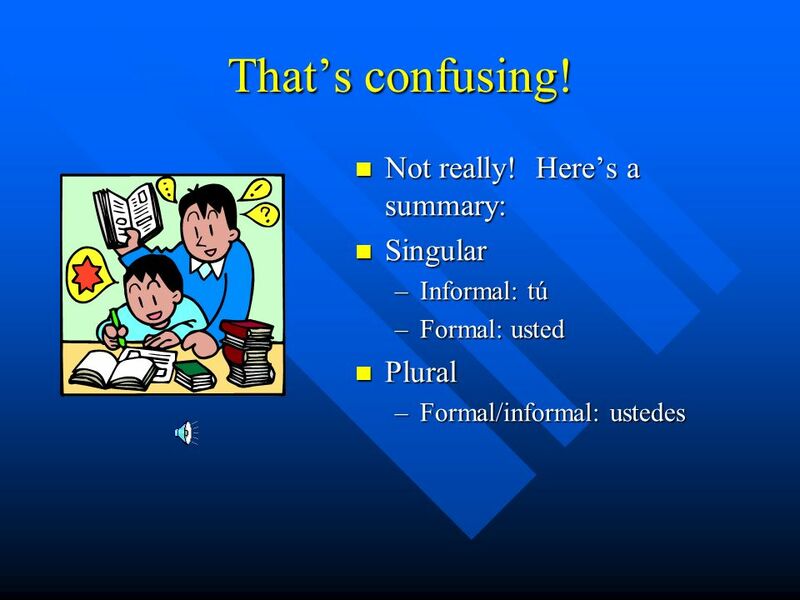 10 Tú & usted In Spanish, things aren’t quite that simple. 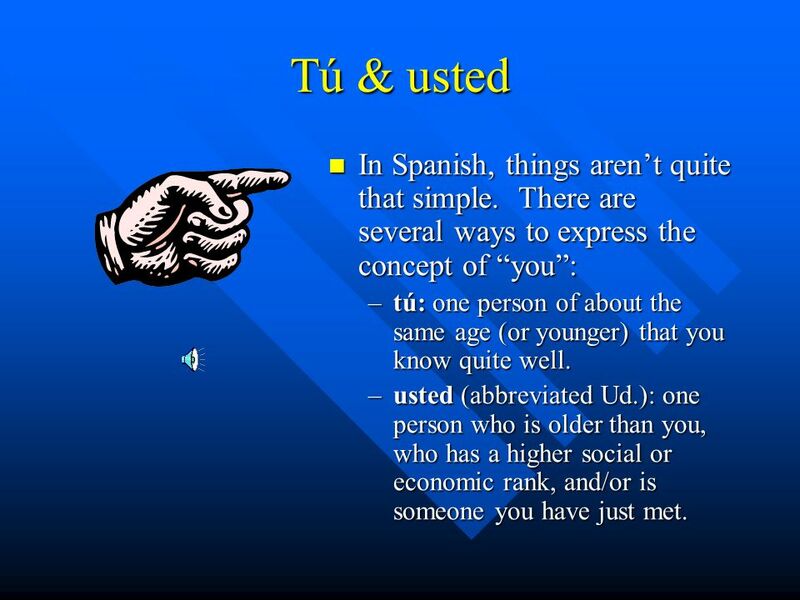 There are several ways to express the concept of “you”: tú: one person of about the same age (or younger) that you know quite well. usted (abbreviated Ud. ): one person who is older than you, who has a higher social or economic rank, and/or is someone you have just met. 11 Wait! There’s more! 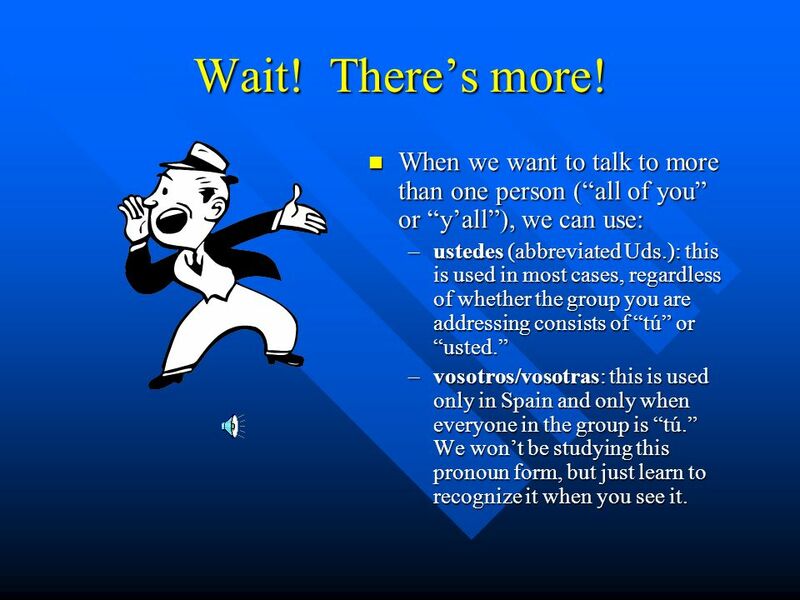 When we want to talk to more than one person (“all of you” or “y’all”), we can use: ustedes (abbreviated Uds. 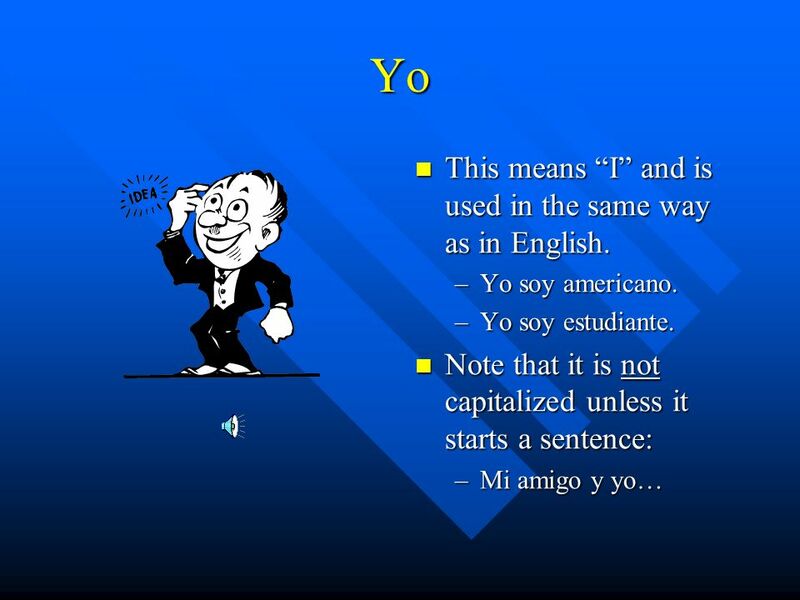 ): this is used in most cases, regardless of whether the group you are addressing consists of “tú” or “usted.” vosotros/vosotras: this is used only in Spain and only when everyone in the group is “tú.” We won’t be studying this pronoun form, but just learn to recognize it when you see it. 13 One more point! In English, we always have to use a subject pronoun. Look at these sentences: Went to the store. Speaks German. Like classical music. Without the subject pronoun, we don’t know who we are talking about. 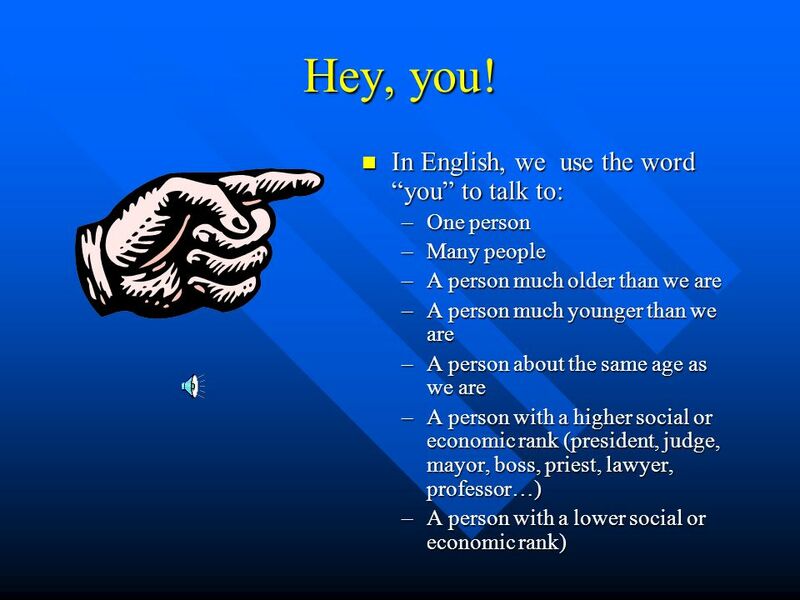 The verb doesn’t give us enough information: “like” can refer to I, you, we, or they. Soy de Chicago. Eres estudiante. Es mexicana. Somos atletas. Son hermanos. 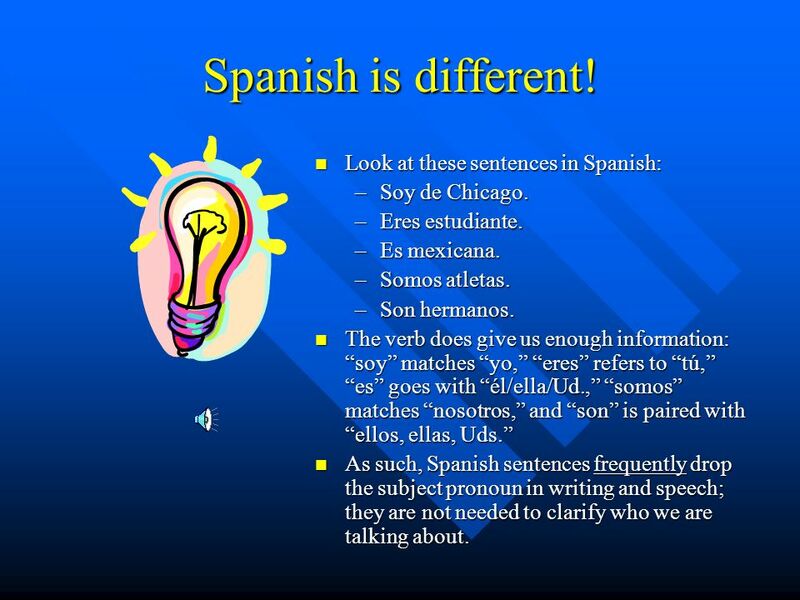 The verb does give us enough information: “soy” matches “yo,” “eres” refers to “tú,” “es” goes with “él/ella/Ud.,” “somos” matches “nosotros,” and “son” is paired with “ellos, ellas, Uds.” As such, Spanish sentences frequently drop the subject pronoun in writing and speech; they are not needed to clarify who we are talking about. 15 Let’s practice! Rewrite each sentence with an appropriate subject pronoun. _____ estudio español. _____ eres estudiante. Juan es mi amigo. _____ es de Chile. Marta es muy inteligente. _____ estudia física y química. Mis hermanos y yo somos atletas. _______ jugamos al vólibol y al fútbol. Mis hermanos juegan al béisbol también [also]. ______ son muy atléticos. 16 How did you do? Yo estudio español. Tú eres estudiante. Juan es mi amigo. (Él) es de Chile. Marta es muy inteligente. (Ella) estudia física y química. Mis hermanos y yo somos atletas. (Nosotros) jugamos al vólibol y al fútbol. Mis hermanos juegan al béisbol también [also]. (Ellos) son muy atléticos. 17 That’s a wrap! 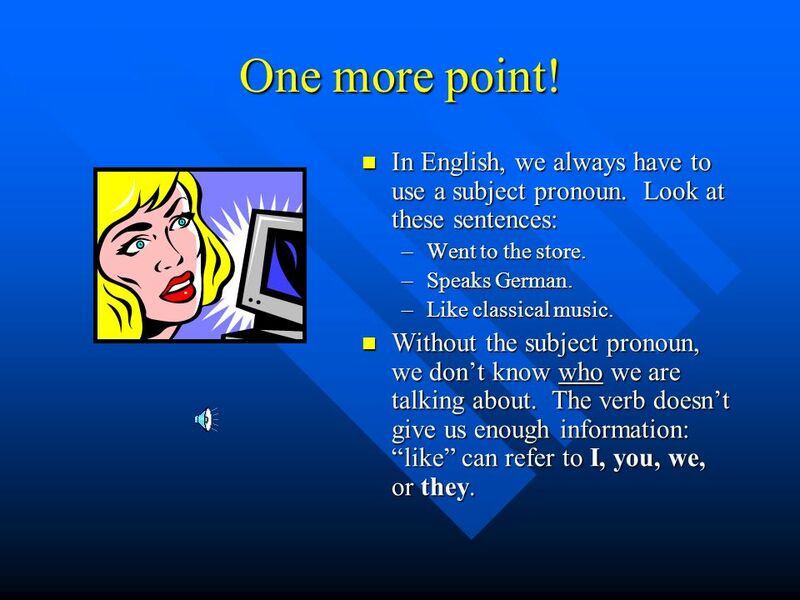 We’ve seen the subject pronoun forms and uses. 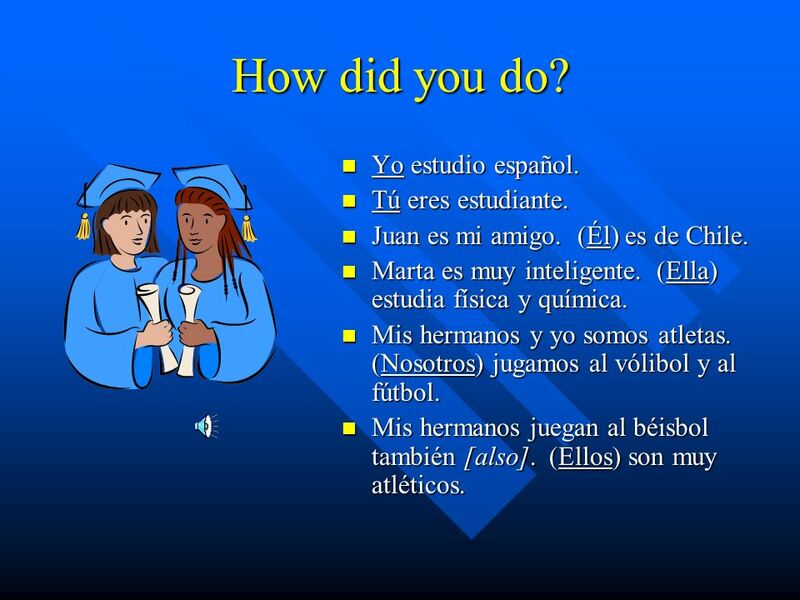 Keep an eye and an ear open for them as you proceed in your Spanish classes. 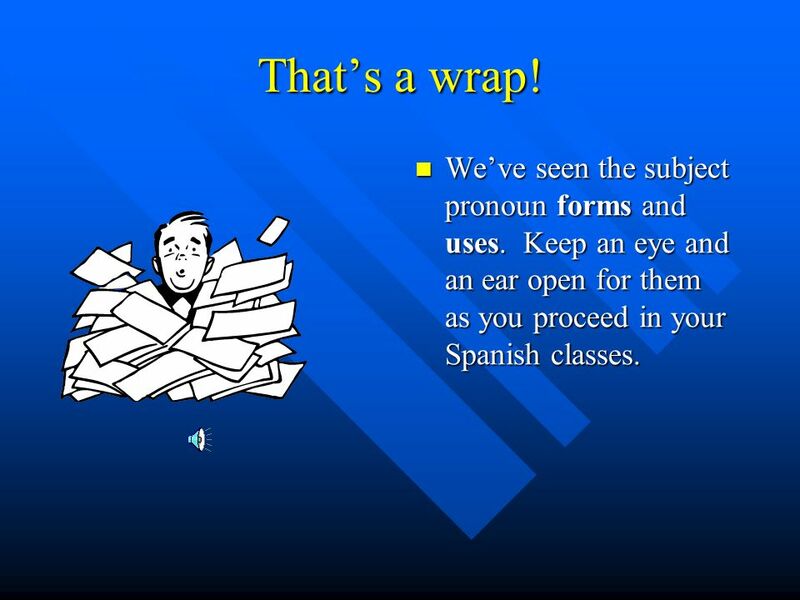 Descargar ppt "Subject pronouns In this presentation, we’re going to look at the form and use of the subject pronouns in Spanish." 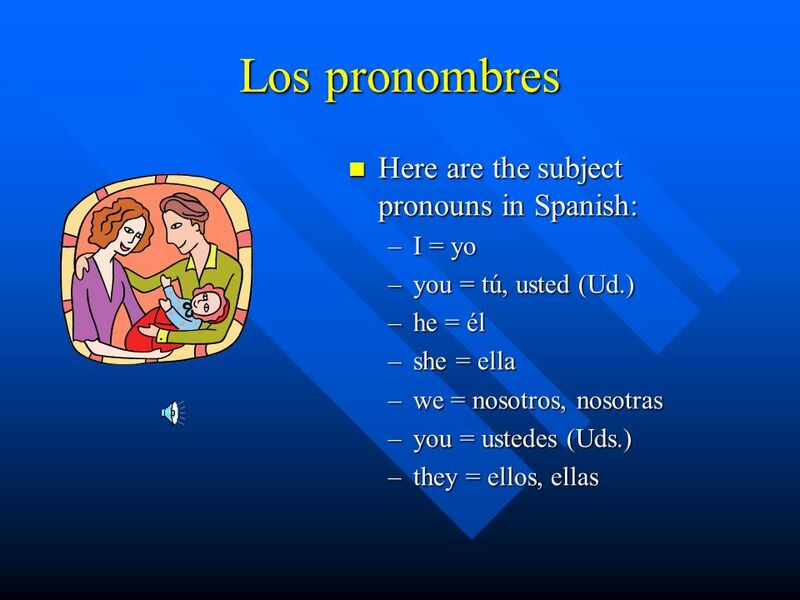 Subject Pronouns & Ser Spanish I Selecting Pronouns Singular Subject Pronoun I You (informal/familiar) You (formal/polite) He, she Spanish Yo Tú Usted.